Critical Condition. Paramount Pictures 1987. I honestly didn’t know this movie existed five minutes before selecting it. 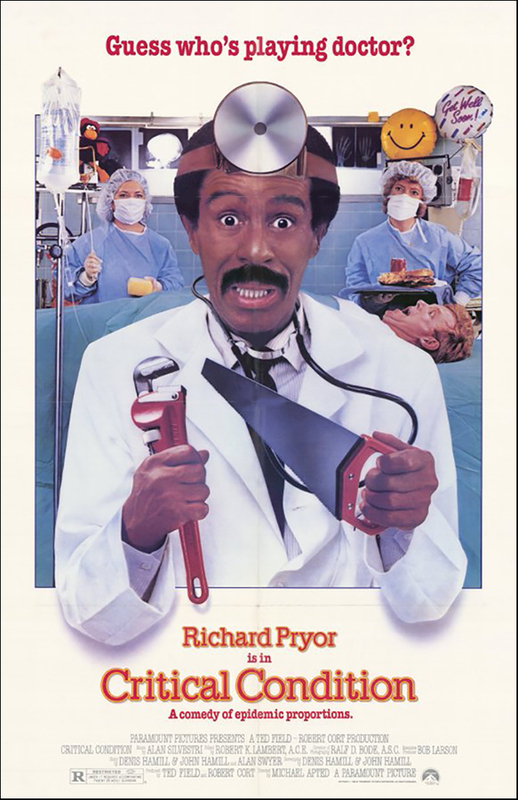 It’s a Richard Pryor vehicle in which he apparently gets mistaken for a doctor while trying to escape the psych ward he faked a plea of insanity to get into. It’s exciting going into a movie blind. I have generally a good impression of Richard Pryor, though I can only come up with two or three movies I’ve seen him in, and one was Superman III. I can’t think of another one that I’ve seen that didn’t show up here. Eddie Lenahan goes to a loan shark for money for his business, gets bullied into being a bag man, and then it turns out the Feds tricked him into bringing a wire into the meeting with the loan shark, and since he’s holding the bag, he’s going to prison right alongside the shark and his musclebound associates. So he overacts his way into a bogus insanity plea and gets transferred to the mental ward of a hospital. Attempting to take advantage of a tropical storm blackout to escape, he gets mistaken for Dr. Slattery, the doctor meant to be in charge of the hospital overnight. Unfortunately, his attempt to steal an ambulance and disappear into the night fails because the only bridge off the island got knocked out in the storm, so now he’s stuck pretending to be the man in charge throughout the siege, with lives at stake. I’m kind of surprised that aside from Richard Pryor, who is pretty Richard Pryor here, the next biggest name I saw brought up to promote it was Joe Mantegna. Sure, my interests don’t seem to coincide much with his work, but I would’ve thought Bob Saget would be the bigger name, even though he does have a smaller part. Mantegna is kept away from the action for most of the movie, held hostage by the psych patients who bully him into agreeing to their demands. If he wasn’t as big a name, perhaps those asides wouldn’t have been as plentiful, or perhaps if they weren’t as plentiful, they wouldn’t have gone for him. Meanwhile, Saget is one of the more junior ER doctors, whose main job is for Pryor’s character to delegate the most unpleasant jobs to. This movie is mainly concerned with satirizing and critiquing the modern hospital industry. The most senior doctor under the man Eddie is assumed to be is chiefly concerned with avoiding lawsuits. He refuses to take any sort of action in anything but the best conditions (and being battered by a hurricane is anything but the best conditions) because he won’t accept the malpractice liability. All of the hospital’s problems through the night (except for the murderous escaped convict, who only serves to catalyze the climax) are ways the bureaucracy at the top has been negligent, brought to light by the crisis situation. And it takes a complete outsider to come up with the harebrained stopgap solutions to the mechanical failures and say “I don’t care about the rules, just help these people” to the bureaucratic failures. It’s also about Richard Pryor getting five seconds away from taking advantage of a gorgeous nymphomaniac patient when she casually mentions her STDs, but it’s mostly about him reforming the hospital’s practices and being reformed himself. It altogether makes for a fun bit of movie.